In a small club, Dillinger Escape Plan seem larger than life, and that huge presence doesn't shrink a bit when they lay claim to a giant outdoor stage (and as much of the surrounding space as they can reach). Despite the complexity of their songs, the New Jersey five-piece sounded great at Heavy T.O., playing songs from all over their catalogue. But it wasn't the sound as much as the acrobatic antics that made their too-short set an irresistible pleasure. Frontman Greg Puciato sang and screamed from every edge and corner, milking feedback from the speakers, or climbing stacks of them to perch high above the floor. Revelling in the crappy weather conditions, Puciato even invited a couple of very muddy guys to join the band on stage for a while. Guitarist Ben Weinman was more comical in his frolicking but equally intense, and with he and Puciato crowd surfing and leaping around, it made their bandmates' amped-up performances seem almost ordinary. 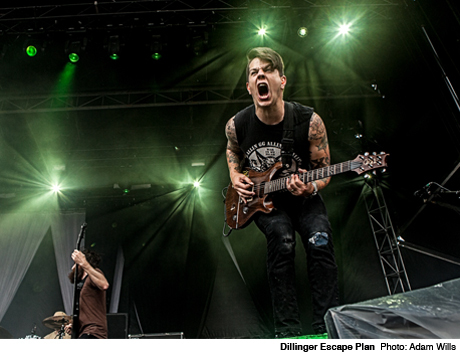 Dillinger Escape Plan were a late edition to the Heavy T.O. schedule but a priceless one.